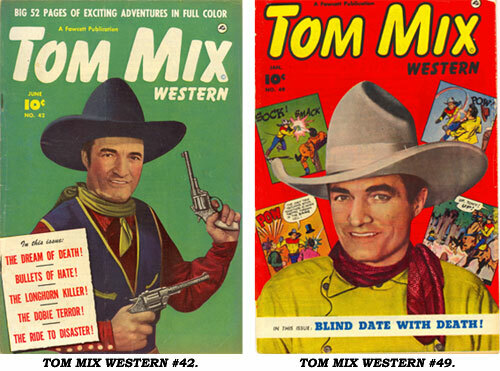 Tom Mix’s incredible popularity lived on in Fawcett published comic books (and on radio) long after his sudden death in a car crash in 1940. 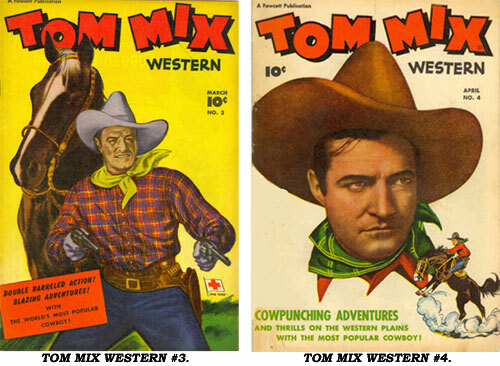 However, before his death there was a series of Tom Mix Big Little Books—some based on his movies; 48 different National Chicle Company gum booklets (2¾x3"); and a series of Ralston Purina comic books (See the previous column). 6, 7, 19, 24-61. Artwork or painted covers enhanced #3, 5, 8, 9, 10-18, 20-23. The paintings were superb by Everett Raymond Kintsler (1926- ) and Norman Saunders (1907-1989). 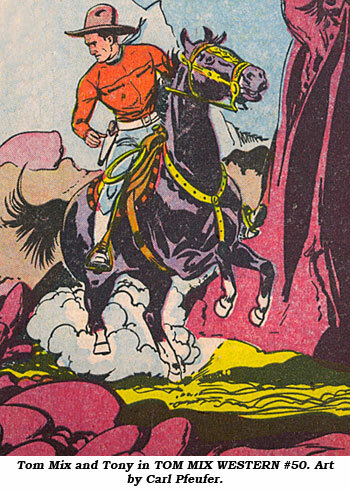 Tom always rode Tony in the comics as he had on screen, but the character of Sheriff Mike Shaw in the town of Dobie was unique to comics. Virtually every story in the 61 issues was rendered by the excellent team of artist Carl Pfeufer (1910-1980) and inker John Jordan. Pfeufer, born in Mexico City on September 29, 1910, moved with his family to New York in 1917. After illustrating for pulp magazines in the ‘30s, he worked on syndicated newspaper strips such as “Don Dixon” and “Gordon Fife and the Boy King”. 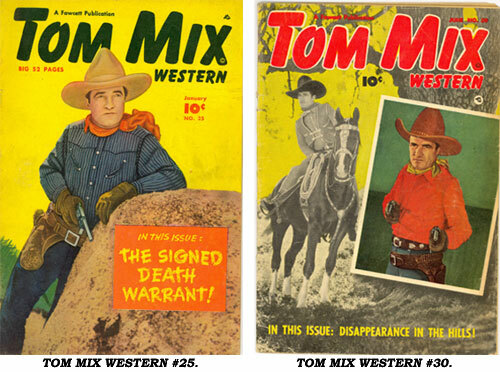 He also sold illustrations to OUTDOOR LIFE, READER’S DIGEST and other publications before becoming a mainstay at Fawcett from ‘45-‘52 on not only TOM MIX WESTERN but DON WINSLOW OF THE NAVY, KEN MAYNARD WESTERN, IBIS,THE INVINCIBLE and various war and crime comics. Pfeufer’s art and design training allowed him to bring accurate anatomy and perspective to his work resulting in a high level of visual excitement. 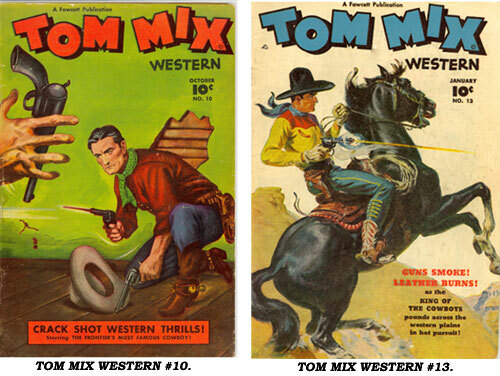 His superb multi-panel fight scenes brought to Tom’s stories something no other cowboy comic could capture. 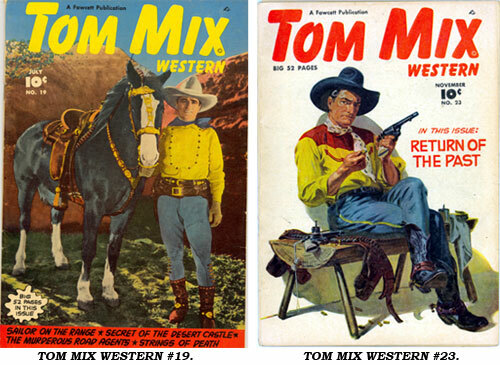 Due to Pfeufer, TOM MIX WESTERN has to rank #1 among all the Fawcett westerns. 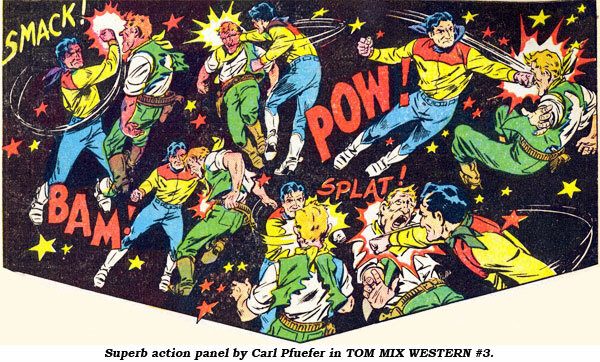 In the beginning, issues #1-11, Tom was decked out in a red and yellow shirt with blue pants. In #12-17 he wore a green shirt and gray pants…although the drawn covers still had him in red and yellow shirts. As of #18 Tom settled on a red shirt and blue pants. 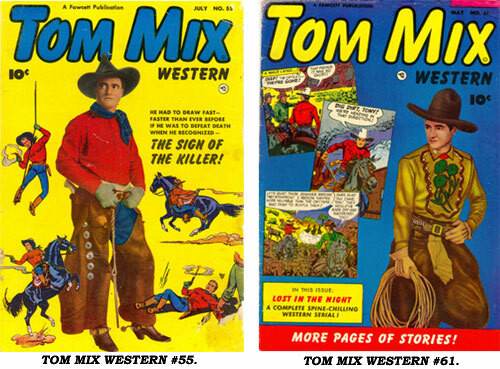 The page count in TOM MIX WESTERN varied from 36 to 52 pages. 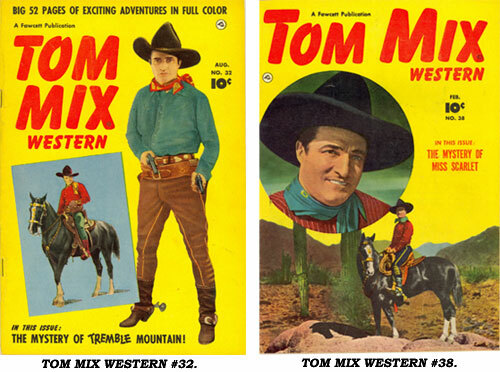 Bonus features in many issues were “Round-Up Time With Tom Mix” (Indian lore, tricks, games, western lore) (ending with #48); a list of radio stations airing “Tom Mix” (ending with #47); Ralston Trading Post ads with premium offers (ending in #49); and occasional “Rocky” Lane one page Carnation Malted Milk strips. In particular, two stories are notable—in #9 an axe-wielding killer is featured in the story “Hands off”. Dr. Fredric Wertham singled this story out in his notorious SEDUCTION OF THE INNOCENT book, citing a panel in which the insane axe handler supposedly chops off a sleeping Tom’s arm. However, it is actually a Mix dummy the villain attacks simply planted there as a decoy to trap the killer. 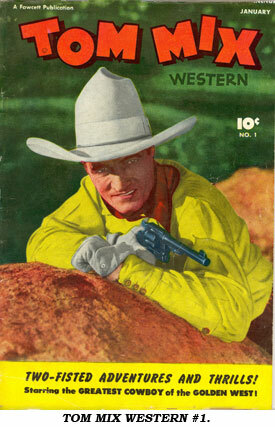 Also unusual for a western is “The Cursed Dobie Dope Ring” in #57 in which Tom puts an end to two dope smugglers. In Fine #1 runs $159; #2—$75; #3-5—$57; #6-17—$42 to $48; #18-61—$25-$35. 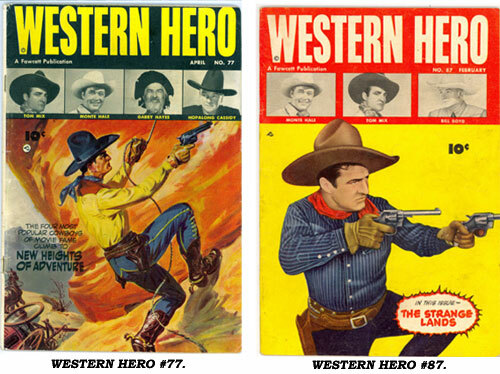 As mentioned in last month’s column, Tom also was featured in Fawcett’s REAL WESTERN HERO (shortened to WESTERN HERO with #76) from #70 (#1) to #111. Tom’s cover featured on #77, 79, 81, 83, 85, 87, 90, 92, 94, 97.